Ah, fall. It makes me want to bake. Something about the cooler days, and the changing leaves, and the amazing apples and pumpkins everywhere – and possibly the 30 billion photos of amazing baked goods on Pinterest – but it makes me want to bake. Clearly. Hasn’t been much else here on the blog lately. I obviously need to do some cooking as well. We’ll try to change it up next week. Maybe. Apples are probably my favourite fruit. We go through them like crazy. Adhering to the apple a day policy is just fine by me. Especially in the fall. And definitely in these molasses apple bars. With brown butter glaze. Don’t skip the glaze, and don’t skip the browning the butter part. In either the bars or the glaze. It is so much better then regular old melted butter. It just is. Plus, once you start browning your butter, you won’t be able to stop. It’s that good. You’re welcome. 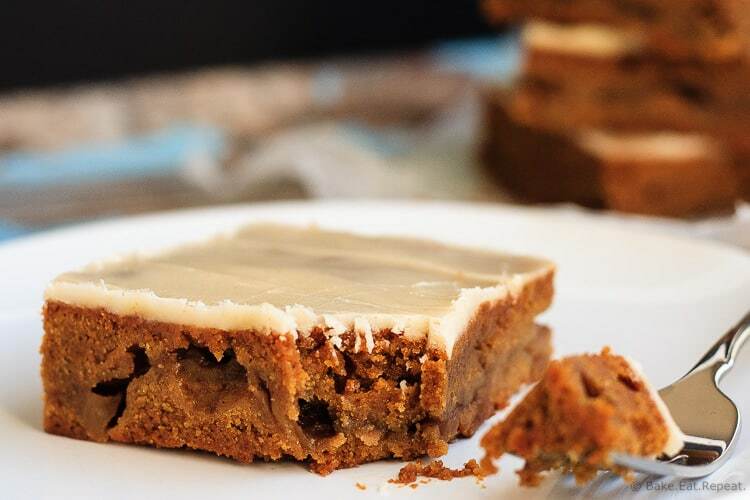 These molasses apple bars taste a little gingerbread-y, with the molasses and spices in them. They’re a variation on my caramel apple blondies, but with molasses and some ginger and cloves, and a glaze instead of the caramel. I think they’re even better then those blondies, and they were pretty fantastic! It’s fall, and these bars are the perfect treat. Grab a cup of coffee and dig in. They’re amazing. Preheat the oven to 350 degrees F. Lightly grease a 9x13 inch baking dish (I use glass) and set aside. Prepare the apple filling. In a saucepan stir together the apples, brown sugar, butter, cinnamon and corn starch. Place the pan over medium heat and cook, stirring occasionally, until the apples have softened and the filling has thickened slightly, about 5 minutes. Remove from heat and set aside. In another small saucepan, brown the butter for the bars by heating the butter over medium heat, whisking constantly once it’s melted. It will melt, then get frothy, then clear up and get brown bits on the bottom of the pan. Once you see the brown bits, remove it from the heat, continuing to whisk it for another minute or so. Pour the brown butter, making sure to get all the browned bits on the bottom, into a large bowl. Add the sugar and the molasses to the brown butter and whisk together until smooth. Whisk in the eggs and vanilla. Add the flour, salt, cinnamon, ginger and cloves and stir until just combined. Pour half of the batter into the prepared baking dish and spread it around evenly. The batter will be very sticky. Spread the prepared apple filling over top of the batter in the pan, trying to get it right to the edges. Spread the remaining bar batter over top of the apples. Again, it’s very sticky so is a little tough to spread. When adding the batter on top of the apples, try to drizzle it all over rather than dumping it all in the middle so it’s easier to spread evenly. Bake for 40-45 minutes until the bars are golden brown and a toothpick inserted in the center comes out with only damp crumbs on it, but no wet batter. Don’t over bake them. Set the pan on a wire rack to cool slightly. While the bars cool a bit, make the glaze. Brown the 1/4 cup of butter, the same way you did with the bar batter. Once it’s browned, remove it from the heat and whisk in the vanilla and powdered sugar. Add 1-2 tablespoons of water to thin the glaze and whisk until smooth. Spread the glaze over the warm bars and allow them to cool completely. Slice the bars into squares and serve. They keep well for up to 5 days in an airtight container, or can be frozen for 3 months. b]Source:[/b] Adapted from my [Caramel Apple Blondies . We go through tons of apples all year! In the fall, they're only better. :) These bars look so delicious, Stacey! 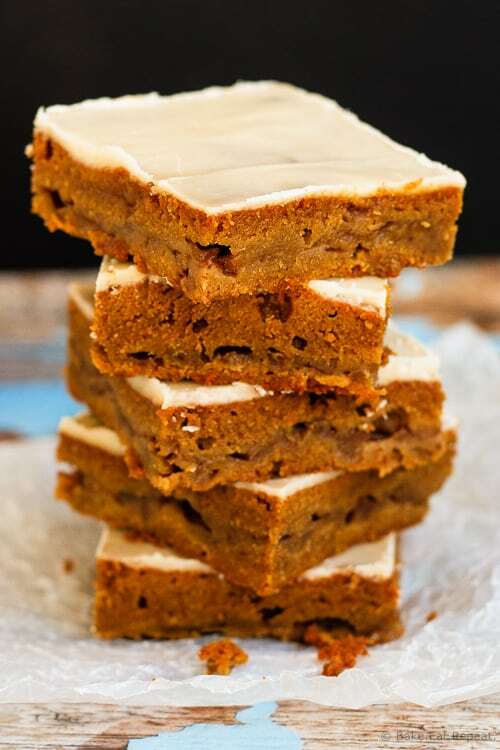 I'm a huge fan of molasses and brown butter, so these are calling my name! Yup, me too. I rarely go to the store without buying a big bag of apples. And they are so good in the fall I get obsessed with them! Thanks Marcie! I am ALL about fall baking, and these flavors sound incredible! I can't wait to give them a try! These look so good, pinning to my apple desserts recipe board! Thank you for sharing this recipe! I think molasses is the forgotten ingredient. I wish I could use it in EVERY recipe!! Haha, totally a problem for me too! Something about the colder weather - I am constantly baking. Thanks Ashley! How delicious! I love the apple and molasses combination. I know people who could get really addicted to these! Oh maaaan! That brown butter glaze is killing me, girl! These are absolutely all the fall things in one bar! LOVE. Fall definitely puts me in a baking mood too. These bars look soooo delicious and that glaze is just perfect! These bars looks completely irresistible! I love the brown butter glaze! Fall flavors are my favorite too - especially apples! Seriously once you start browning butter, you can't stop! It's just amazing! Love these bars Stacey! WOW! I am sitting over here in my still 100+ degree temps envying your Fall baking beauties! Pinned for the time the weather goes below 80... Maybe? Sometime? I hope! Haha, well in my mind that's better then 6 months of cold - I'm just hoping we get a long fall and the snow holds off till at least November! But it does make for good baking weather! :) Thanks Senika! I'm seriously ooooohing and aaaaaaahing over here over that brown butter glaze! I would not be able to stop eating these bars! You had me at brown butter glaze! These bars look amazing!! What a delicious fall treat! Molasses, apple, that brown butter glaze! My favorite fall flavors. 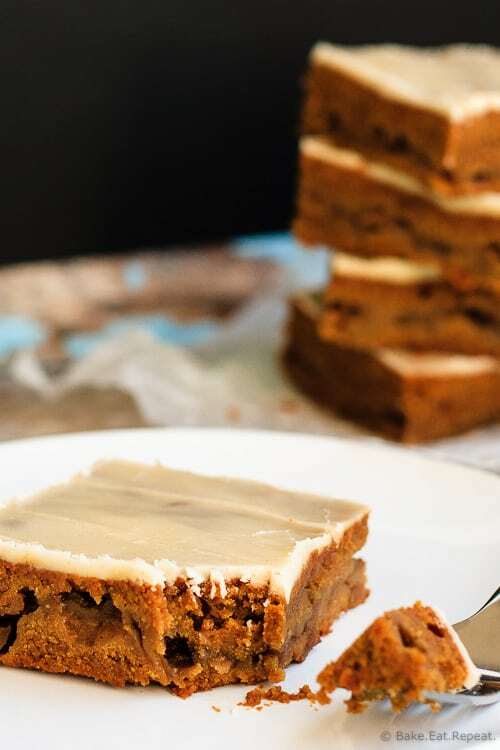 You first had me at that glaze... then you had me at the brown butter... now you have me jumping into the kitchen to make these completely awesome bars!! Brown butter in recipes always makes me want to run to the kitchen, it's always a good idea! Thanks Katerina! Apples and baking in the fall - they just go together right? Thanks Meg! You had me at apples and brown butter! These bars are a wonderful fall treat. I bet they made your house smell amazing! Cinnamon and apples generally do! And that's one of the reasons I love fall! :) Thanks Jen! It really does, doesn't it? So good. Thanks Sara! I love baking in the fall because of the cozy flavors and cooler weather! 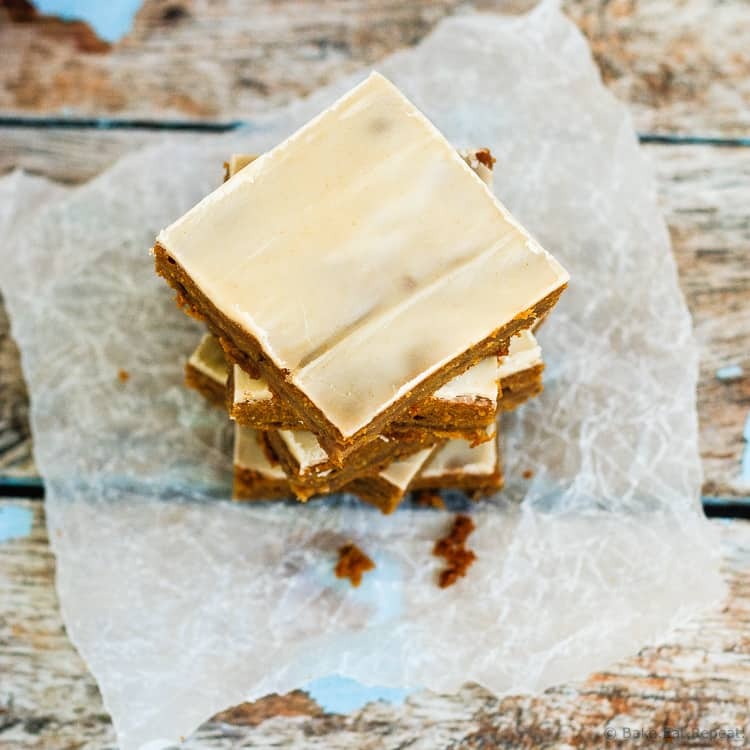 These apple bars look gorgeous, Stacey! I love the addition of molasses in here. I bet your house smelled SO good when these cuties were baking. Sounds like the perfect fall treat!